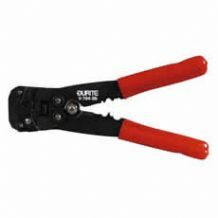 Recent feedback about this item: "Fantastic bit of kit you can tell its German design"
This easy to use fully automatic PROFFESIONAL tool will strip and cut cable from 0.2mm2 - 6mm2. Automatically adjusts for different sizes of cable. Measuring scale on the jaw side. Cutting jaws & crimpers on lower portion of handle. If you wish to break into an existing cable. Strip back the insulation with this tool in seconds, expose the conductor. Wrap the additional cable around the exposed conductor, solder, tape over. Job done. Ideal for towbar installers, etc. Compact, functional and easy to use, a professional tool! PLEASE do not confuse this item with cheaper items, this is a highly professional item. We have used an identical item day in day out for years without the slightest problem! 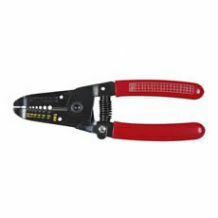 Ideal for automotive cable stripping and cutting. Cuts & strips cable from 0.5mm2 - 4mm2. Cuts & strips cable from 0.5mm2 - 6mm2. 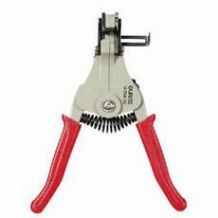 This easy to use fully automatic tool will strip and cut cable from 0.5mm2 - 6mm2. Auto adjustment for different sizes of cable.